Rub halibut pieces with olive oil, salt and pepper. Prepare grill or place saute pan over medium high heat. Add olive oil and heat until shimmering. Cook halibut about 3 minutes per side. In a large sauce pan over medium heat combine garlic and shallot until cook until translucent. Add thyme, marjoram, tarragon, oregano, lavender. Add vermouth and reduce to 1/4 cup liquid. Add chopped tomatoes and bay leaves. Reduce heat to simmer. Simmer 20 minutes until liquid reduces and tomatoes break down. Taste and adjust seasoning with salt and pepper. Remove from heat and set aside. Heat olive oil and 2 tablespoons butter in medium pan over medium eat. Add onion and shallot and saute until translucent, about 4 minutes. Add garlic and cook one minute. Add abborio rice and stir until each grain is completely coated. Add wine and stir until liquid is completely absorbed. Add vegetable stock in ½ cup increments (stirring constantly until liquid is absorbed before adding more.) Remember to stir constantly as this is what creates the creamy texture. This process should take about 30 minutes. Fold in parmesan cheese, lemon zest, 2 tablespoons butter, thyme and parsley. Taste and season with salt and pepper. Remove from heat, cover and keep warm. To serve spoon risotto onto middle of plate. 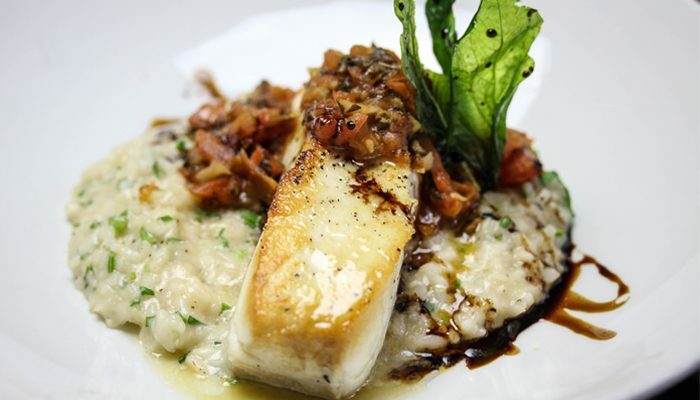 Place halibut next to risotto and spoon Provencal sauce over halibut. Drizzle plate with aged balsamic vinegar.